Stainless steel meets painless style with the impending release of the Nike 6.0 Dunk SE "DeLorean" Sneakers, inspired by the DeLorean DMC-12. Just 1,000 will be sold worldwide, but they're worth fighting for when you see the outer sole. Mimicking the taillights of a classic DMC-12, the bottom of the shoe's got the same gridded-off red-yellow-white pattern. The grained matte silver, no-sew exterior's designed to give off the stainless-steel look. 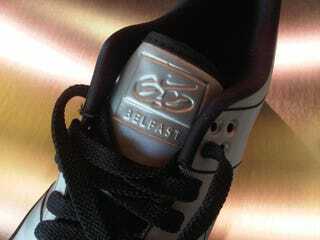 The nicest touch might be the Belfast stamp on the tongue. Or maybe it's the DMC stamp? All it's missing is self-lacing. The shoes go on sale Black Friday at select outlets.